Takeaway: Stems support and protect the plant, and store and transport food. Add a page in your plant notebook for each of the plants listed: corn, wheat, peas, grapes (scroll down for great info on grapevines), hop vine, bindweed, woodbind, strawberry, white clover, petunia, rose, raspberry, crabapple, crocus, onion, and leek. Make a notebook page with the definition of tendril at the top, and list below several different plants whose stems grow in tendrils. You may find this list at UCLA helpful. Make a list of plants that twine around a support. Help at Gardeners.com. Make a list of plants whose stems run along the ground and then send down roots for new plants. You’ll find examples of Stoloniferous Plants at UCLA. Take a close look at different types of plant hairs at BackyardNature.com. We covered plants that grow from bulbs in Lesson XI; however if you missed it, use this list of plants that grow from bulbs at Ohio State University to create a page in your notebook. List the different roles a stem plays (support for plant, protection from pests, food storage, and to be eaten!). Something to do #1: If you didn’t complete your investigation of the differences between annuals, biennials, and perennials from the last lesson, you can make a chart showing the differences between them now for the first activity. You’ll find a great resource below. Something to do #2: Make a list of differences between a tree, shrub, and herb. Create a chart listing types from each group. Something to do #3: You’ll need to start by listing the different ways that plants protect themselves mentioned in the lesson and then choose a few plants from each category to make your list (bristles, sticky substance around stem, prickles, and thorns). Something to do #4: Make a list of the ways man uses the stems of plants or things you use every day that are made from stems. Something to do #5: If you didn’t already enjoy them in the lesson on How Plants Grow, you’ll find resources below for making a list of stems used for food. Something to do #6: If you don’t want to do the guessing story, you can use Drawing & Writing Paper to draw a stem/plant you are interested in, and list below its distinguishing characteristics. Something to do #7: just for fun, you can use this organizing chart at ReadWriteThink.com to list the different types of stems, and their attributes. Memorize and recite 1 Thessalonians 5:21 or 1 Corinthians 16:13. Use Psalm 104:14 for copywork or dictation. To connect the leaves with the roots and to hold the leaves, flowers and fruits in favorable positions, the plant needs a stem. Usually the stem is branched, sometimes with thousands of branches as in an old oak tree. However, some palms may be a hundred feet tall without a branch. The stem and the leaves taken together are referred to as the shoot. When a seed develops we can see a shoot and a root growing in different directions. Besides serving to support the leaves and the flowers, the stem has the job of transporting (or circulating) water, food and other useful substances from leaves to roots and vice versa. Often, too, food is stored in the stem, as anyone knows who has chewed a piece of sugar-cane or eaten a stalk of asparagus. The different parts of a stem are arranged in a series of hollow cylinders, one outside the other. Let us examine a young sunflower plant. The very center is the soft pith. In young plants the pith is often rather large in proportion to the rest of the stem. Usually in large trees the pith has almost disappeared and is hard to find. …Next to the pith is the xylem. In some smaller plants especially those that die down to the ground every winter the cell walls of the xylem are generally so soft that you can crush them with a light pressure. 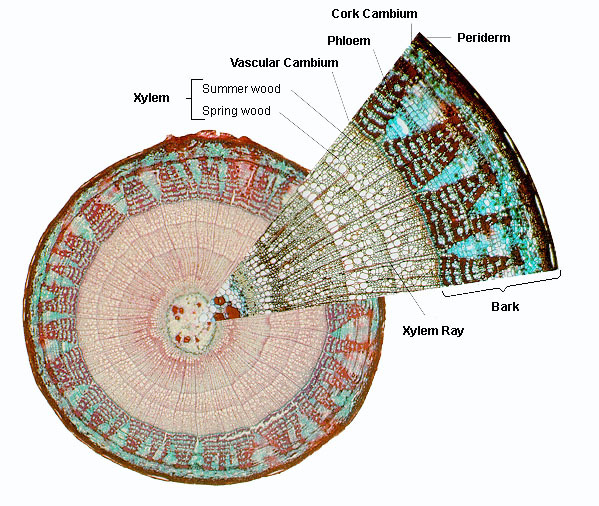 In trees and also in many smaller plants the cell walls of the xylem become thick and hard, forming permanent wood. If it were not for the still woody xylem, most larger plants would have to creep on the ground instead of standing upright. The xylem is the passageway for water to go up from the roots…. Next comes a layer of soft, slippery cells called the cambium. The cambium cells are very much alive; they have soft cell walls and active protoplasm. As long as a tree lives, the cambium cells continue to grow and to divide to make new cells. As is true in the root, all of the new xylem and phloem cells are formed by the gradual transformation of young cambium cells…. The phloem, just outside the cambium layer, consists of several types of cells. The phloem cells that conduct most of the food down from the leaves are the sieve tubes. The walls separating two sieve tubes have many little holes in them. These perforations make it possible for dissolved sugars, vitamins and other nutrients to move along rapidly. The above description of the structure of stems fits the majority of seed plants, but in the large group called the monocots, which includes the grasses, the palms, the lilies and the orchids, there is no permanent cambium layer. Also, the xylem and the phloem are not arranged in cylinders in the stem, but occur in separate bundles scattered through the pith. Ready to go outdoors? The Handbook of Nature Study covers plants beginning on page 453, and continuing through page 731. The beginning pages cover how to begin the study of plants and their flowers, and then follow guidelines for investigating specific wildflowers, weeds, garden flowers, cultivated crop plants, trees, and flowerless plants. Stem structures, functions, types, life cycles and stems that we eat at the University of Arizona Cooperative Extension. The function, anatomy, features and types of stems for older students at the Colorado State University Extension. Explanation of various stem modifications discussed in the lesson with useful photographs at McDaniel College. Descriptions and types of vine plants at the Purdue University Cooperative Extension. A description of the parts of the plant and their functions, including stems at the University of Missouri Extension. What is the Life Cycle of a Plant? Interactive investigation of annuals, biennials, and perennials. Answer the questions to move through each type. Part of the Great Plant Escape at the University of Illinois Extension. Two stem experiments at MSNucleus.org. Labeling diagram from EnchantedLearning.com that includes the stem. You can label the remainder of the diagram as we come to those sections in future lessons. Students examine photos to meet the identification objectives at Plant Anatomy. Free public domain title that makes an excellent introduction to plants and can be used as a helpful plant study reference. Dinah Zike was known for her foldables before lapbooks became popular. In this book she incorporates that learning tool with learning about plants. Includes 24 complete lessons including templates, activities, the scientific method and suggestions for further activities and research. You’ll find an example lesson at the publisher’s website. Lessons on roots, stems and leaves are included. Free chapter excerpt and sample at Funtastic Unit Studies with activities for covering seeds, roots, stems, leaves, flowers, and growing plants aimed at 4-7 year olds (click on Plant Unit). ALEX lesson plan that explores the capillary action of stems. Helpful short unit study at the Oklahoma Cooperative Extension Service that includes activities and worksheets covering science, art, language arts, and math. 11-page download from the Texas Farm Bureau includes a small booklet to put together with room for listing flowers, stems, leaves, roots, and seeds that we eat. Diagram for notebook at the University of Illinois Chicago. Cross section for notebook at the University of Illinois Chicago. Free blank nature journal sets for drawing, illustrating, copying, or narrating.